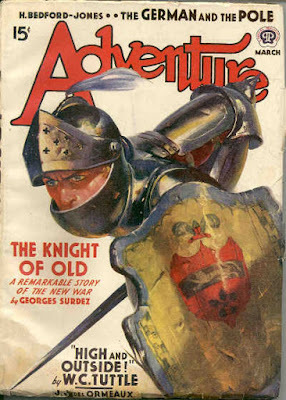 That's an intriguing cover on this issue of ADVENTURE, and inside are stories by H. Bedford-Jones, W.C. Tuttle, Georges Surdez, Luke Short, Frank Gruber, and J.J. des Ormeaux. Looks like a mighty fine issue to me. 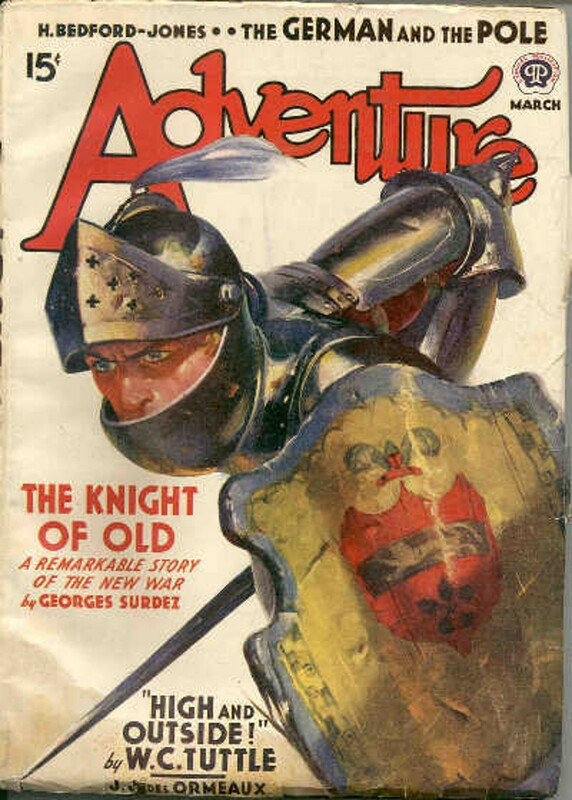 Right around this period Ken White took over as editor and ADVENTURE continued as an excellent title until 1948 when he left. Howard Bloomfield had done a great job reviving the magazine in the middle and late 1930's for Popular Publications. I always look forward to, and appreciate Walker's comments. Do you have a preference between the Bloomfield and Ken White runs in Adventure? I've read almost exclusively ASH era Adventure, but have ordered some later material. Also, I just read the first Jimgrim story Adventure at El-Kerak which I thought was fairly decent, but not even an above average story for this magazine. Kind of like some of the Surdez material I've read, Adventure at El-Kerak had a lot lot lot more politics and intrigue and martial history than actual adventuring. Craig, I've enjoyed both Bloomfield and White periods in ADVENTURE. When Popular Publications took over the magazine in 1934, Bloomfield was responsible for reviving the title and making it a big success again. Ken White took over in 1940-1948 and continued the quality. I collect original pulp art and I've noticed that White paid careful attention to the interior illustrations. Instead of the usual one piece of art per story, he often had several illustrations like BLUEBOOK. I guess I prefer the Ken White years in the forties but Bloomfield was also excellent. Concerning the Jimgrim series by Talbot Mundy, it was a very unusual series because instead of stressing action, Mundy stressed characterization and as you note, politics and intrigue. Not the usual pulp plots thats for sure! I read through the series many years ago and was impressed at just how different the stories were from the usual pulp story. Thanks for the insights once again!